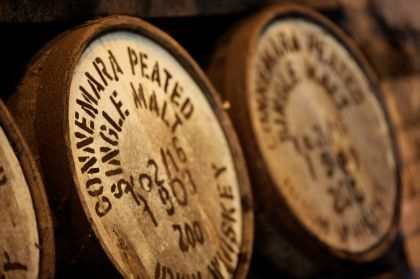 Connemara has been produced by Cooley Distillery for a number of years now. It is currently Ireland’s only peated single malt, that is, a single malt with a smoky flavour. Peated whiskeys had become somewhat obsolete in Ireland. Given the country's concentration of peat bogs there would likely have been a long history of peated whiskey in Ireland. The construction of Ireland's iconic canal system however also heralded the arrival of a cheaper fuel source: coal, and the demise of smokey whiskey. Thankfully Cooley have revived this tradition. In order to “peat” a whiskey you must dry the barley over a peat fire. The smoke clings to the barley during the drying process and as result imparts its flavour on the spirit. The amount of smokiness in a whisky is measured in phenol parts per million (ppm). In Connemara’s case its 20 ppm. By point of reference, the Scotch 'Ardbeg' would be closer to 40 ppm. You can vary the the ppm by how much peat you use in the drying process. Recently Cooley released a heavier peated whiskey, Connemara Turf Mor which weighs in at approx 60 ppm. 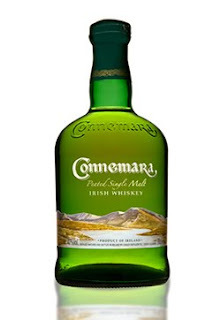 Connemara Single Malt is straw yellow in colour and with charcoal on the nose. Once you get past the smoke, it has flavours of apples and pears, it glides across the palate effortlessly and has a lingering smoky finish. Great blog. Obviously passionate about your subject - Keep up the postings!